A high-octane show that showed Chiara Boni La Petite Robe signature style of modern, dynamic and practical silhouettes, the collection took the audience into an imaginative trip across Europe. Focusing on the refined aesthetic of the Old Continent Chiara Boni precious fabrics and rich embellishments were mixed the brand’s signature stretch jersey fabric, guaranteeing fit and outstanding comfort. 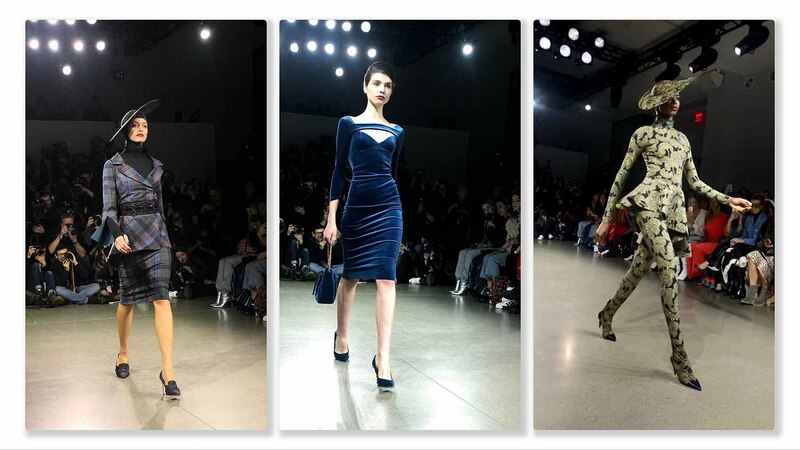 Plush velvet gave intriguing touch to dresses and separates. Velvet and taffeta gave interesting texture to sumptuous maxi dresses adorned with bows. And as an homage to the European tailoring tradition, classic suiting patterns, including herringbones and checks, add a mannish feel to jumpsuits with applied pockets, suits and frocks, all combining a sartorial attitude with an urban, functional appeal. Peplum is back with a vengeance and hats are the accessory de rigueur. While opulent shoulders and ample sleeves continue to steal the spotlight, Chiara Boni La Petite Robe first introduces a selection of knitted pieces, including coats and crewnecks lined with the brand’s iconic jersey. In front row: Caroline Vreeland, Julia Retoin-Roitfeld, Sofia Resing, Devon Windsor, Liliana Nova, Nichole Galicia, Leonie Hanne, Paola Turani, Kimberly Guilfoyle.